We will visit your site and give you an estimate, free of charge! Swim rafts available from Otter Island, Hewitt, and more! 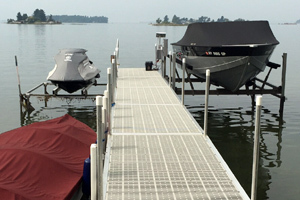 Order your dock or lift today! • Buy the frame and deck your own! 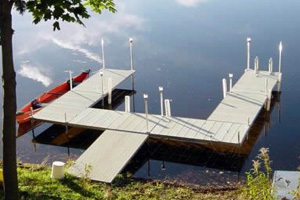 Decks, Docks and Beyond is an authorized New York State dealer for Aluminum docks and boat lifts. We sell Hewitt Lifts and Roll-a-Dock products. We deal in both residential and commercial lines. We offer a variety of services that include on-site assessments, assembly, delivery, installation, warranty and repair work. We also stock popular dock and lift accessories such as the Solar Dock Lite™ and other solar products to light up your deck, dock, or pier. CALL (315) 265-2262 for an appointment! Our affiliates- click or tap the logos below to visit their respective websites. Enter discount code "DECKSD-10" on buyhewitt.com for 10% off online orders! * This location is a display. We are based in Colton , NY and there is not a salesman on-site in Massena.